You Are My Sunshine, My Only Sunshine! Are you singing it too or is that just me? 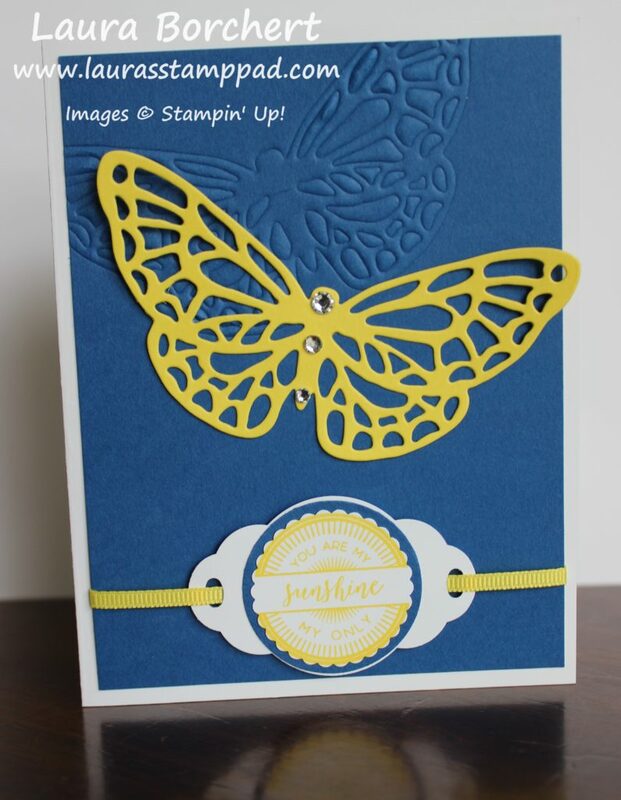 This greeting is perfect for this beautiful butterfly card! It is so bright and cheerful! Blue and yellow go so well together, don’t you think?? I love these colors – Pacific Point and Pineapple Punch!!! I started with a Whisper White card base. 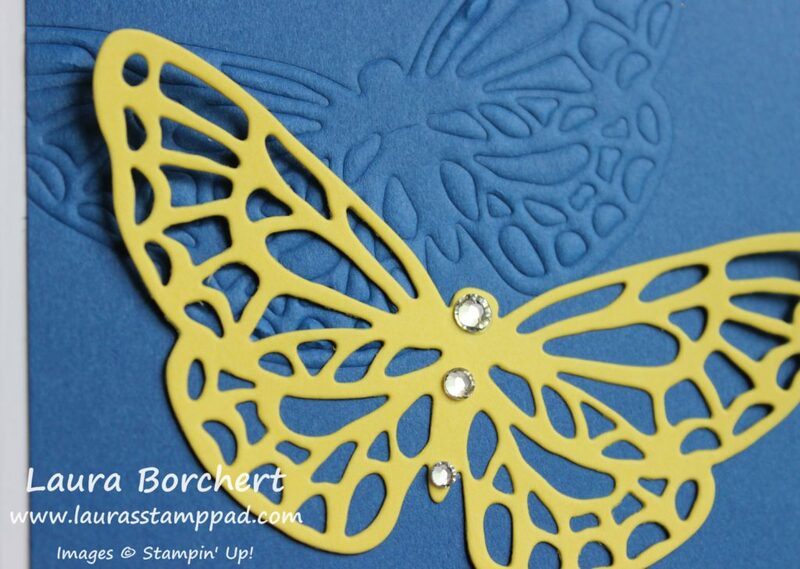 Next, I took a piece of Pacific Point (4″ x 5-1/4″) and embossed the butterfly from the Springtime Impressions Framelits. This is a framelit that I used to emboss with the Embossing Mat. Check out this post and this post on how to emboss with framelits. Also, I die cut a full butterfly in Pineapple Punch. Don’t layer this onto your card front just yet because we need to do that greeting and wrap the ribbon around to the back. Now for the greeting, I used a few different punches. First, I punched out a white label with the Pretty Label Punch. Next, I punched out a 1-1/2″ Circle Punch in Pacific Point. 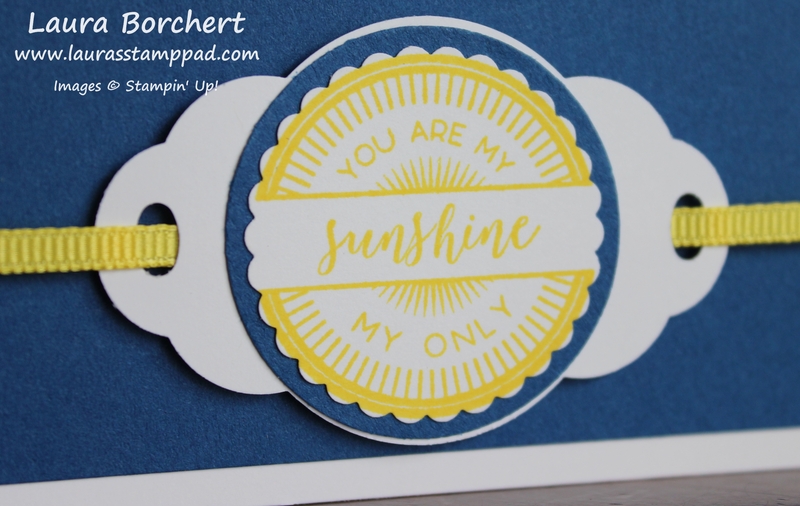 Then I stamped the greeting from the Stitched All Around Stamp Set in Pineapple Punch and punched it out with the 1-3/8″ Scallop Circle Punch. For the layering, I added them all together with regular Snail Adhesive. For those little ribbon slider holes, I used the Detailed Trio Punch. In order to line it up in the correct spot, I punched out a scrap one, placed it in the desired spot and pressed with my scissors to make a mark. Then I slid it into the Detailed Trio Punch and punched the hole. I did that on both sides and slid the ribbon through securing it on the back with Stampin’ Dimensionals. Then I added this to the bottom of the embossed Pacific Point piece. Wrap the ends of the ribbon to the back and add this piece to the card front! Now it is time to finish off with that die cut butterfly. I suggest putting this on last so that you don’t put it too low and in the way of your greeting. Using Mini Glue Dots, I adhered it and then added a few Rhinestones down the center for some bling! I love it! This is a great card to have on hand to brighten someone’s day. If you would like to see this all in action, check out the Video Tutorial below or click here to see this all in action! I hope you found this super useful. Be sure to give the video a thumbs up if you liked it and don’t forget to subscribe if you are new. If you would like a notification when I post a new video, be sure to click the bell right next to the subscribe!! !